Our recent visit to Nashville had a single mission: attend the wedding of the Dear Man’s dear nephew and his dear fiancée. Mission accomplished! The wedding was one of those really, really good ones — where the couple are so right for one another and it’s truly a blessed occasion. Plus, at the reception, there were s’mores. When we weren’t spending time with family, we did some history geek tourism and we stopped by a bookstore whose Instagram feed delights me. The lightness of those white bookshelves! Those light fixtures! And the bookshop is every bit as pretty in person (though my photo doesn’t do it justice). So we’ve got some fiction (such a favorite!) and a new nonfiction book about a president, by an author whose writing I adore. Anyone else doing any bookstore tourism this fall? Any great finds? Recently the Dear Man and I joined my sister’s family on a vacation to Costa Rica to visit our aunt and uncle. So yes, I packed two swimsuits and a sun hat and a gallon of sunscreen and sandals… but most of my packing energy focused on the books. There were hard decisions to make, people. My primary criterion: weight. So I went with all paperbacks. So here’s the thing. With a party of 8, things stay busy. And the most fun I really can even imagine. I love these people. My vision was this: while the teenagers are surfing, their auntie will be reading. In reality, it was too much fun watching the kids surf and talking with my people and playing in the waves. So the books stayed in the beach bag, and that was just fine. We spe nt time in the air (ziplining— a huge triumph for she who fears heights) and in the water (paddle boarding in the sea). I grabbed a little reading time while hanging out on the balcony of the house we rented and lounging in the room with a view (oh my land, what a view). I actually bought the book at the Charles Lindbergh home in Minnesota during a long weekend, so it was a book bought on vacation and read on vacation. And the book made me think all kinds of thoughts, and it was a pleasure to have the time to consider them. It wasn’t until our long flight home that my books got much attention. And then it got serious. I finished the Lindbergh book. Then I read our upcoming book club book cover to cover. This sounds all impressive, but since the book is only 176 pages long, it’s not that grand an achievement. Sarah Gailey’s River of Teeth was a great vacation book: it’s a swift-moving, surprising, violent Western romp featuring hippos. I don’t mind flying, but the cramped quarters make me glad to be able to escape somewhere else on long flights. Now that we’re home, the poor neglected book is in a holding pattern while I get caught up on laundry and all the other adulting things that are clamoring for my attention. But the lovely thing is that once I immerse myself in the book again, it’ll transport me not only into the story itself, but also into The Vacation Feeling. I love that. So, my fellow readers… what’s your favorite vacation reading tactic? During a recent long weekend in St. Louis, the Dear Man and I spent one of the best days ever. It included a kitschy antique store visit, Route 66, a fast food restaurant we checked off our list, the Daniel Boone home, another fast food restaurant we didn’t expect to see (where we ate amazing donuts), an iconic bookstore, life-changing pizza (at our 78th pizza place), and the Gateway Arch. Of course we’re gonna focus on the bookstore, partly because this is a book blog but mostly because It Blew Us All Away. I learned about the Novel Neighbor from the What Should I Read Next podcast, where Anne interviewed Holland Saltsman, bookstore owner and reader extraordinaire (and they even taped a live show there). On one of the episodes, Holland raved about The One-in-a-Million Boy. I’ll be forever grateful for that. And when we visited her fantastic bookstore, I fell head over heels in love with it. I was seriously in a blissed-out daze. This bookstore is intensely comfy and cozy, yet it’s also wide-ranging and it just keeps going. And there are delights around every corner! Oh, my goodness, dear readers. If you’re ever in St. Louis, I sure hope you stop by the Novel Neighbor. It’ll bliss you out, too. 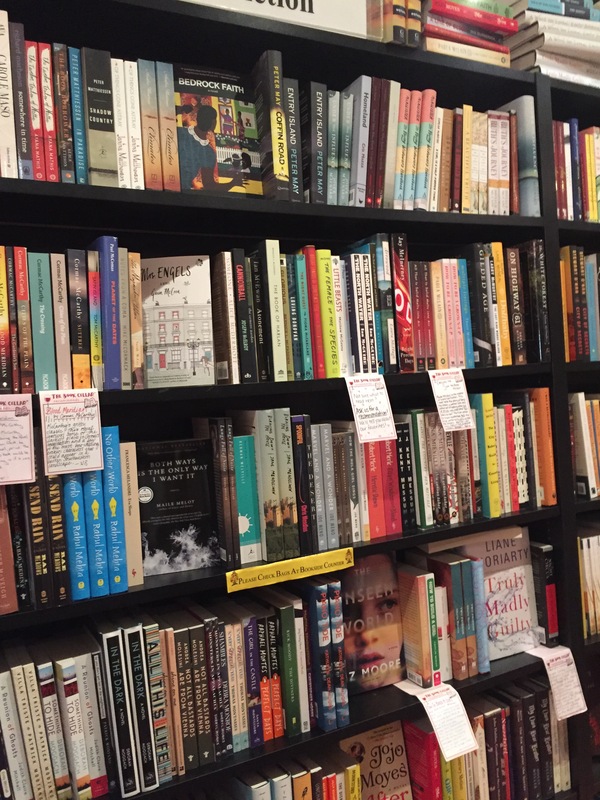 My fellow bookish tourists… what’s your best bookstore experience? 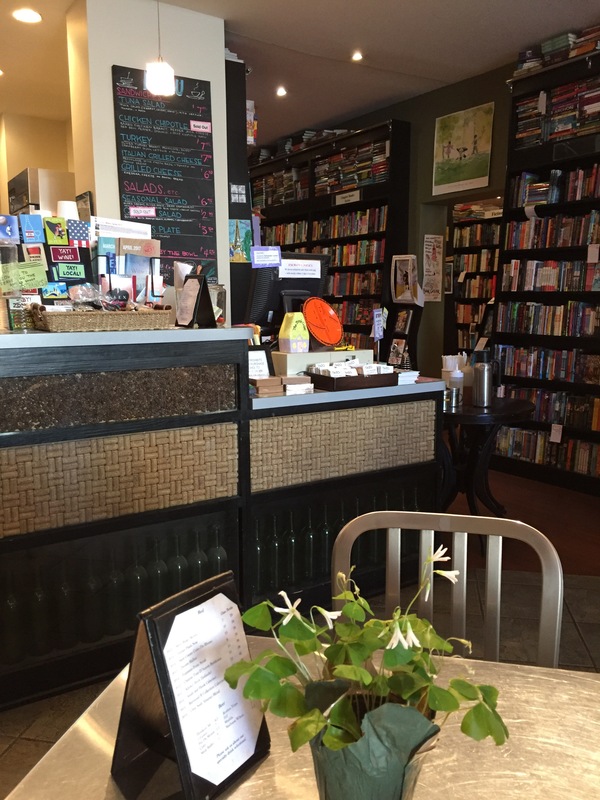 This is the story of the day we visited Parnassus Books, aka The Day I Just Kept Flapping. On our recent trip to Nashville, the Dear Man, his Dear Dad, and his Dear Sister met up with his Dear Nephew and Dear Nephew’s Dear Girlfriend (we have a serious entourage) to visit Ann Patchett’s bookstore. I’ve been ogling the place on Instagram for months now, and visiting the place is (of course) so much better! I was instantly taken in by the shelf of “Penned & Picked By Patchett.” There were shelf talkers containing blurbs she wrote, recommending books! We all book chatted our way through the bookstore, and the Dear Nephew bought a book I recommended, based on his reading tastes (Station Eleven by Emily St. John Mandel). And the Dear Man and his Dear Dad got to hang out with one of the shop dogs. The bookstore is utterly seductive: wood floors, comfy chairs, friendly dogs, a piano, and tons of carefully selected books on the shelves. Seriously: their backlist picks are inspired. …but I chose This Is Where You Belong by Melody Warnick, because it’s a book I really want to re-read. While this bookstore is delightful on its own, knowing that Ann Patchett co-owns it and is involved with its design and operation — that adds some serious sparkle. I felt a little bit starstruck when we were there. And then… I didn’t want to leave. If you’re ever anywhere even close to Nashville, my fellow readers, all I can say is: Get thee to this bookstore. 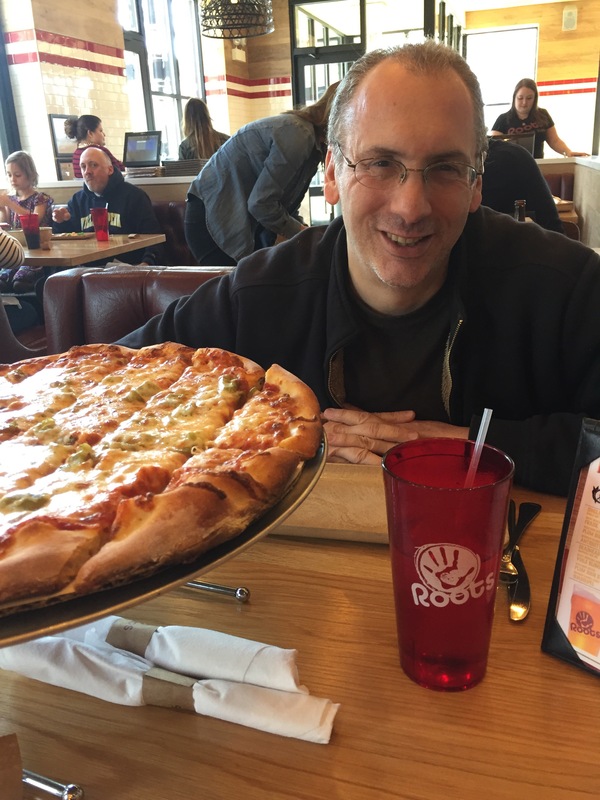 And Roots Handmade Pizza: on our list! So we decided: lunch there first, then bookstore. Cuz we’re tactical geniuses like that. And then the Dear Man parked the car right next to a Little Free Library, so: further bliss. 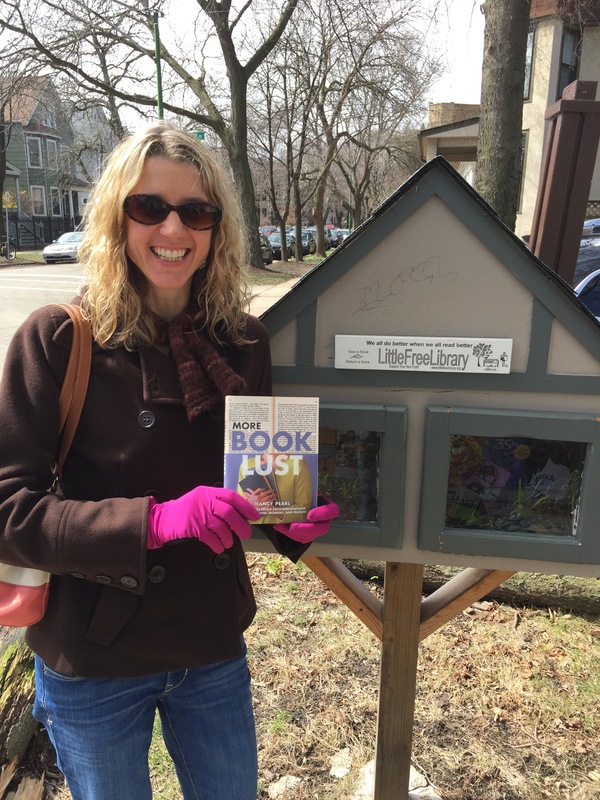 Then I had this face, cuz: Nancy Pearl book in the Little Free Library! 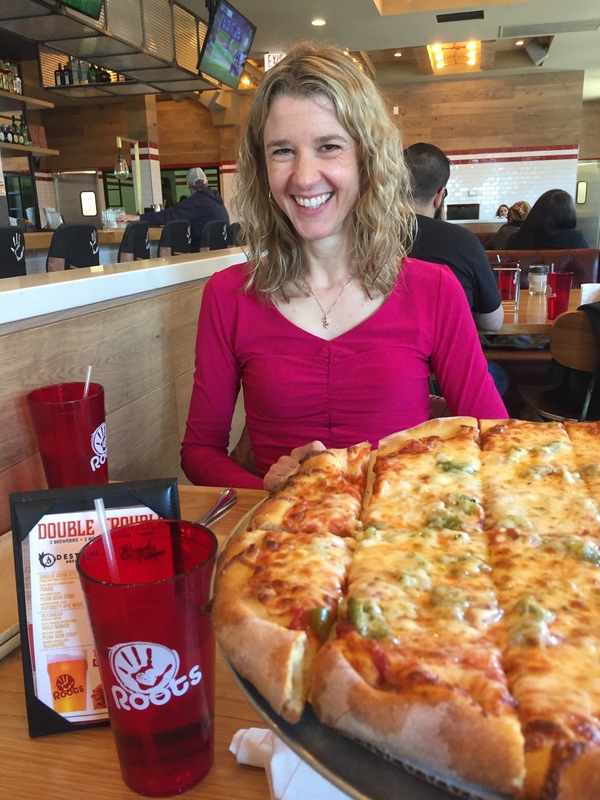 Here’s why: Quad City pizza has malt in its crust, which makes the crust a little bit sweet. So the crust is actually fantastic all on its own. Then you add just the right amount of zingy sauce and cheese and onions and green peppers, and you have yourself one winner of a pizza. After I ate way too much pizza, we walked over to the bookstore, which is in the charming Lincoln Square neighborhood of Chicago. We hit another shop on the way. And then… bookstore wonderment. The Book Cellar is not small, but it’s not very big, either. It’s simply packed with books. I felt a little bit like I was swimming through the aisles, with books surrounding me on all sides. That was kind of dreamy. The Book Cellar is a book store/cafe/wine bar combo, so there were people wandering the stacks with coffee cups and wine glasses, which seemed really homey. I snapped up the 2nd-to-last copy of The Cubs Way, and then we hit the cafe area of the bookstore for iced coffee, because all that leisure: exhausting. So, readers... What’s your favorite bookish tourist destination? Today we’re visiting Martin Luther King Jr’s birth home and Ebenezer Baptist Church… and we’re going there in the summertime. Last July, the Dear Man and I visited Atlanta, and one of the best things we did was visit Martin Luther King Jr’s childhood home and the church down the street. And I gotta say: Wow. It was a remarkable experience. As we approached Ebenezer Baptist Church (the Ebenezer Baptist Church!) I felt like I needed to pinch myself. It felt like we were walking on sacred ground. It looks just how it looked in all the photos I saw when I was growing up. And the church is now part of the Martin Luther King Jr National Historic Site, so it’s preserved basically as an historic site and no longer functions as a working church. So it feels kind of frozen in time. And then, down the street about two blocks: the house where MLK Jr was born. It’s a lovely house, and it made me happy to think of the young preacher’s son spending his first years there. And then we visited the gift shop next door and I bought a copy of The Autobiography of Martin Luther King, Jr., which I haven’t read yet because I own it. (Anyone else suffer from this malady? The library books get first attention, because: due dates. So the books I own: utterly ignored). But it’s on my 2017 TBR, and that reading experience is gonna happen. I’m looking forward to it. And this year, as we think of Dr. King on this day, I feel especially fortunate to have stood where he walked and where he talked. If you ever have the opportunity to visit, my friends… I highly recommend it. …the reason we visited was the natural beauty. And there it is: best vacation ever. Since the Iceland trip was in the works for more than a year before our departure, I had some time to read up. Beyond the many guidebooks I perused, I also hit the fiction and memoir categories. Granted, I didn’t hit them hard — it was more like I swatted them. 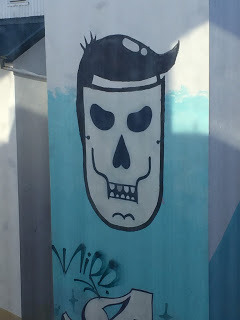 This one made me nervous, because: psychotic killer. Then I reread the real-life Icelandic crime statistics and calmed myself. This is the first in a series, and it’s a fine example of the contemporary Scandinavian police procedural. By which I mean: this sucker’s pretty grim. Super grateful our travel plans didn’t involve bikes or backpacking or a ship’s passage from England. This guy did that stuff, so the rest of us wouldn’t have to. Moore retraced the steps of an old-timey rich dude who was an adventurer, with hilarious results. The book that gave us the alert about the Yule Lads. (Party game: Pick which one is most like you!) 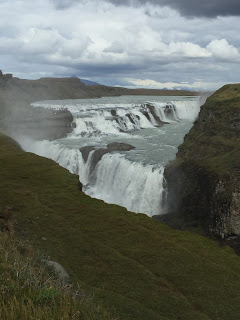 Moss lived and taught in Iceland for a year, and her expat perspective was fascinating. She also interviewed Icelanders who are experts in various topics (elves, trolls, volcanic eruptions, social issues), which added some nice depth. From this book, I also was inspired to bring a hat and gloves on our trip, which turned out to be a very good idea. The Dear Man presents… the Hofdi House! I know. The Pulitzer Prize for Literature and all. But it’s a novel about a sheep farmer living a hardscrabble existence, and I just couldn’t do it. (I checked it out twice. Or maybe three times. It just wasn’t going anywhere for me.) The whole time we were there, I was terrified an Icelander would learn that I was a librarian, ask if I had read Laxness, and then judge me. Fortunately, I dodged any such conversation. International literary incident: avoided. I started reading this one the day before we left, and I wish I’d read it sooner. But also glad I didn’t, because it’ll help me extend the experience of the trip. Dear readers, tell me… Do you prefer to read about places before you visit them, or afterward?